Like many of you out there in the interweb, I love Thai food. Maybe it is the levels of balanced tastes in every dish–the mellow interplay of the sweet with the sour and the dramatic tug-of-war between the salt and spice. Or maybe it the sensitive to textures–the contrasting mouth feel of well-braised softness of some dishes and the fresh crispy crunch of fresh herbage and greens of others. 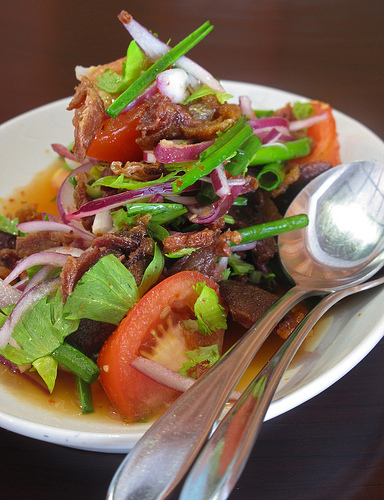 On the surface, Thai cuisine seems so simple and yet is very much complex. But for the ever more cosmopolitan Pinoy palate, it is all about the comforting deliciousness that we crave. Traditional Thai food has become such a staple of Manila’s dining scene that it is almost synonymous with our own homegrown comfort dishes. How else could one possibly explain the growing number of Thai restaurants? Some Thai restaurants fade away but there always seems to be another one sprouting up to take its place. Not all of these restaurants are created equal. Some are the proverbial hole-in-the-wall eateries. Others are sadly soulless fast food chains. And there are exceptional few that elevate what is essentially Thai home cooking to almost the levels of fine dining. That is exactly what AzuThai hopes to bring to the table. Opened by the brother-sister restaurant super duo of Malu and Chef J Gamboa, AzuThai pays homage to home spun dishes of any northern Thai household by sprucing up the look of each dish and yet maintaining the flavors and textures we have all come know and love. Upon the gracious recommendation of our server, we start our meal with a perennial AzuThai favorite, the Poh Pia Paksot or Fresh Thai Spring Rolls (P195). A combination of garden green, slices of tomatoes and onions and traditional-used thai herbs is tightly wrapped in rice paper. 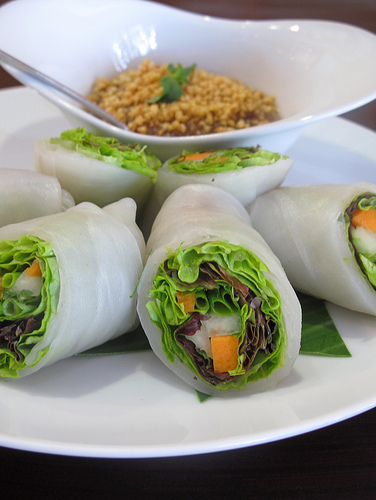 While the sliced spring roll itself is fresh and layered with texture, it is somewhat bland in undressed salad fashion. But what really brings this dish to life is the accompanying dipping sauce of peanuts and tamarind. The sweet/sour sauce coupled with bitter astringent qualities of the spring rolls make for a balanced and appetizing introduction. I need to cool things down a bit. Served with a fragrant bowl of steaming jasmine rice and made with coconut milk, I was hoping that the Massaman Gaeh or Massaman Lamb Curry (P395) would help cool down some of the burn. 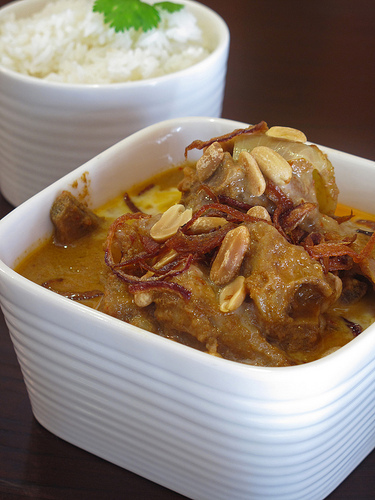 Slowly braised in a light curry, cubes of tender lamb are cooked with a healthy serving of shallots, potatoes and peanuts. This curry was simply delectable. Even when we had consumed ever bit of lamb, potato and peanut, I could not help myself from drizzling the curry gravy over my rice, savoring every last drop of goodness on each grain. Hands down, to eat this dish again is enough reason to return to AzuThai. On perception alone, I am always skeptical of restaurants like AzuThai that take traditional cuisines and try to jazz it up with non-traditional plating and/or cooking techniques. Most restaurants fail at this horribly while only a precious few seem to get this mix of old and new in harmonious balance. AzuThai is happily part of the latter. I ended my meal filled with a sense of comfort as if I had been wrapped in warm blanket, ready for an afternoon nap. wow everything looks so good!